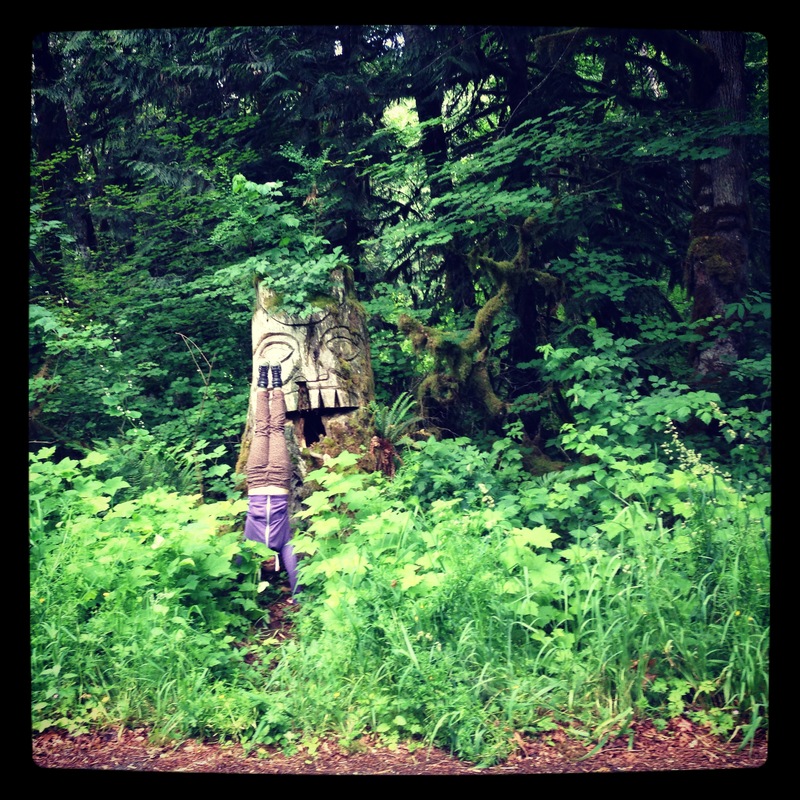 Just over 100 days ago, I decided to take on the Forrest Yoga 365-day Handstand Challenge. This means doing some kind of inversion (anything but a headstand, we don’t really do those in Forrest Yoga) every day for a year…. When I was about 6 or 7, I remember doing handstands every break-time in the summer on the school field. I don’t remember there being any fear of falling or of hurting myself. That’s certainly changed! 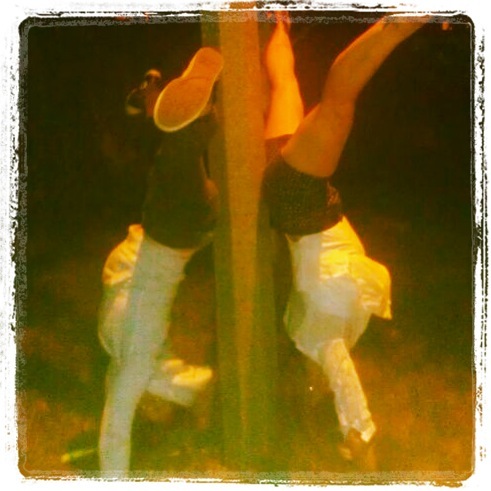 All the girls would line up in the field and do synchronised handstands. We had little blue checked summer pinafore dresses on and white socks, all in row, in uniform. I don’t remember thinking twice about flashing my knickers…. such playful innocence. That’s one reason that I love to get upside down (ha, not to show my knickers, I’ve got leggings to avoid that), but to tap into a state of being that as adults we don’t regularly get to express. Drunkenness or ‘entertaining’ young children are often our ‘excuse’ for playful behaviour. It’s been refreshing to just handstand whenever the mood takes me. For the moment that you’re upside down, you get to feed your inner child. Most of us still have an inner child and I know now that if I neglect mine, I get cranky and a little bit sad. 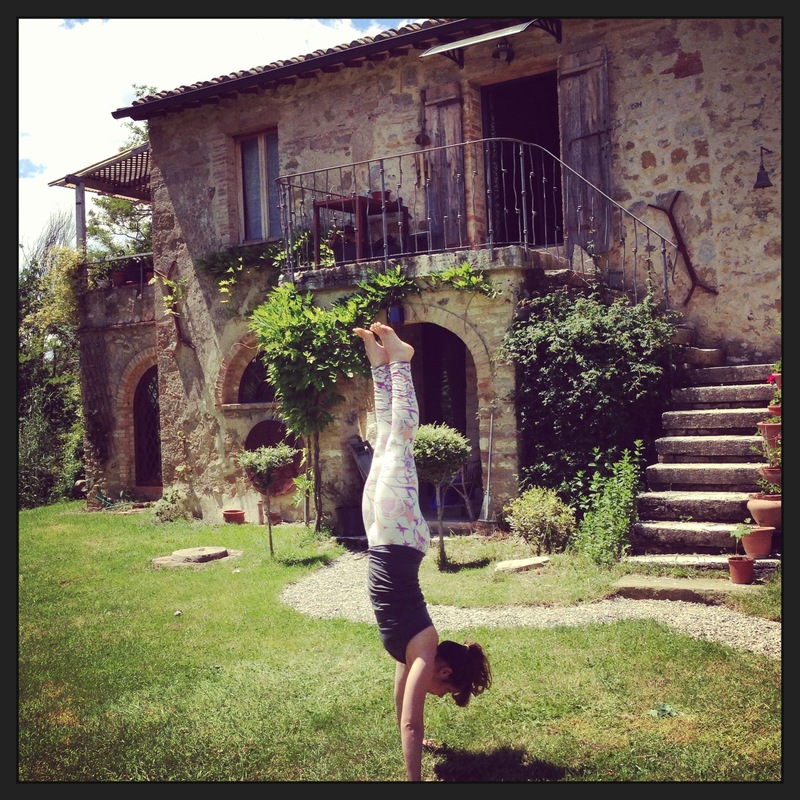 There’s also something quite naughty about being an adult and doing a handstand somewhere unexpected. It’s kind of a turn-on! The 365-day handstand challenge has many layers — fun is just one of those. For me, fear is a huge part of the challenge. Fear of taking my feet off the floor, fear of being upside down, fear of falling, fear of hurting myself. Every time I handstand away from the wall, fear comes up for me and that’s an interesting feeling to dance with when you’ve committed to going to that fearful place EVERY DAY! As the days have progressed, I’ve begun to realise that when I hit the ‘fear of falling and hurting myself’ point, I do a few habitual things: I lose concentration, which makes me fall; I lose the integrity of the pose, which aggravates my shoulder; and I get angry and frustrated at myself for STILL not being able to hold my handstand confidently away from the wall. A few weeks ago, I caught myself hitting the fear wall in the middle of my handstand practice. I was doing the usual frustration thing. My shoulder started hurting, the left side of my neck tightened and it was impossible to go upside down without feeling uncomfortable in some way. That of course perpetuated the frustration. I pushed though for a couple more handstands and felt myself getting more and more annoyed. That then triggered my other fear. One that I like to bury deep inside…. Fear of not being good enough. Wow. There it was — my eureka moment. In my life and on the yoga mat, when the fear of not being good enough creeps in, I flunk out. It’s funny really, I’m pretty intense and passionate about the things I love and believe in. Flunking out has never been something that I associate with myself, but I do it — I flunk out on me. When I’m feeling insecure about something, which isn’t often, but it does happen — I get stupid and lose contact with my body and my instinct. This seems to only happen when I’m working on inversions on my own too. When I’m partnered up, no problem. I can do anything when I have the support of someone else — there’s no fear of falling or failing. I can translate that into a pattern in my life… When I know my sh*t, when I know I can do something, when I am confident — I am driven, impassioned, unstoppable! But if there’s even an inkling that I won’t be able to achieve what I set out to do FIRST TIME I get pissy with myself. I’m naturally a fast learner, so when something doesn’t click straight away for me, I find it hard to handle. “Why can’t I get this”, “what’s wrong with me” etc, etc. Working on not being stupid! It’s funny as I was typing this, I realised that I’ve been ‘doing’ the 4 pillars of Forrest Yoga. 1) USE BREATH — Breathe into tight spots, breathe through the fear. I know this works because I’ve used it so many times before to shift things in life and in poses. Now I’m consciously tapping into my breath in inversions. 2) BUILD STRENGTH — Focusing on connecting to the Serratus Anterior muscles. Building the foundation of what I need to support myself upside-down. I would actually get the feeling in some handstand poses that I couldn’t support myself. That exacerbated fear! If I build strength I’m less fearful. In life? Not leaping into something without the right strength and support is a good place for me to start. As I’ve said in blogs before, I was a burn-out queen so getting support measures in place like giving myself enough time to eat, rest, practice yoga and play is a good move! 3) WORK WITH INTEGRITY — As soon as I lose integrity in the pose (i.e. the trapizius takes over) I now come out of the pose and do something that helps to regain the connection to serratus. How does that fair up in life? Well, if I feel like I’m out of my depth, lacking energy/enthusiasm, or forcing myself into something that’s a struggle, I back off and evaluate! If this sounds like you — breathe deeply and do something that connects you to your strength. Maybe that’s as simple as cooking a meal that nourishes you completely or perhaps writing down 5 things that went well today. Then go back to the problem with your integrity in tact, it usually looks and feels very different. The day that I got massively frustrated, actually to the point of tears (eek! ), I decided to change something. I did all of the above and then I slung on shuffle on my ipod. Back in Black by AC/DC happened to come on. “Yes, I’m back — Yeah, yeah, yeah, yeah” 🙂 After a bit of a rock out to the tune, I did a handstand without touching the wall. My husband walked into the room and saw me there — surprised — I was standing on my hands, away from the wall for at least 5 or 6 seconds. I had climbed out of my bog and changed my perspective. It felt good, it felt playful, it felt pain-free, it felt fearless, it was euphoric, I was having fun again! My handstands are still work in progress, as is life. I am getting stronger and I’m pacing myself. My left torso is lengthening out and I’m no longer willing to let myself get bogged down in fear. As soon as I feel that happening, I know that I have the skills and the choice do things differently. I never imagined that the Forrest Yoga 365 Handstand Challenge would be such a roller coaster of feelings, discovery and fun! What I do know is that the more I can steady myself when I’m upside down on the mat, the more confident I’ll be to calmly navigate the times when it fees like my world is being turned upside-down. Aho to the next 200 or so days. 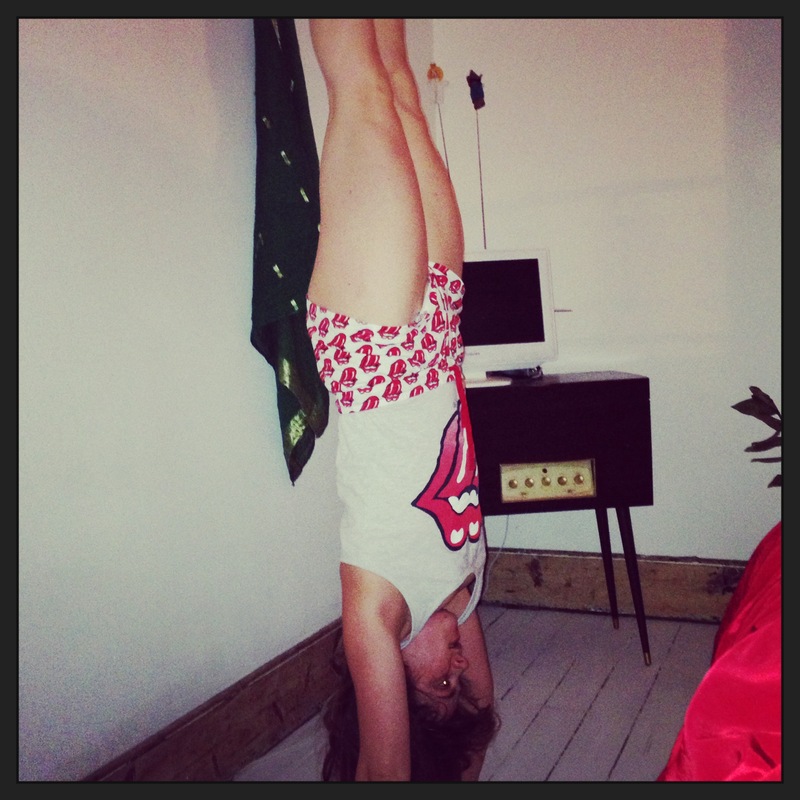 Forrest Yoga 365-day Handstand Challenge You don’t even have to be able to do a handstand yet…. that’s all part of the journey.